Discussion in 'MacBook Air' started by bob616, Aug 24, 2014. My 2012 13" Macbook Air (out of warranty) only has 280 cycles on the battery and is already telling me that I need to service the battery. On this page https://www.apple.com/batteries/replacement-and-recycling/ under the notebook sections it says that the battery is supposed last 1000 cycles before the battery diminishes to 80% capacity. Does anyone know why my battery might be telling me to service it now and if Apple has some sort of warranty outside of their 1 year warranty for batteries? 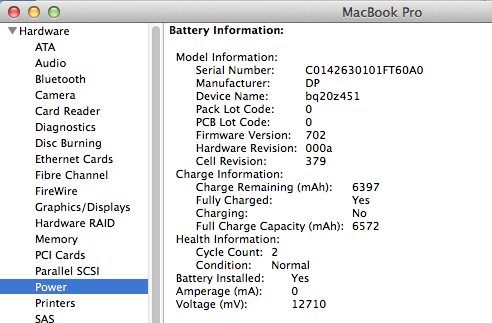 Late 2010 MBP 15" 681 Cycles 84.1% battery charge it lost from 6.9A to around 5.6-8A but still keeps around 4 hours battery. How did you use your computer ? Always plugged in ? or seems a bit too less ? I probably used it plugged in about 40% of the time. How did you get more detailed information like the current? You can get it by clicking the Apple at the top left of your screen, then About this Mac, then System Report then look in the Power section. Got it. Thank you. Is it worth it to have a genius look at it in the Apple Store? I think they are just going to tell you you need a new battery, but sure it is worth a shot if you have a store nearby. Yep, it is not just cycles but also the age of the battery. You could try a calibrate. Current Apple portable computer batteries are pre-calibrated and do not require the calibration procedure.. Since a few years back Apple has used Lithium Polymer batteries.. And they do not have a "memory" like the previously used old gen. NiMh batteries had and therefor made calibration neccessary. 91 cycles and I'm getting the service battery message, too. Seems too soon. My mid-2012 MBA is connected to the charger 90% of the time. That may very well be the reason why. You're supposed to drain it to near empty once a week or so. 2012 13" MBA. 397 cycles and I've had the service battery message since around 325 cycles. Haven't had time to bring it to the genius bar though. Some days I'll get ~4 hours of battery some only ~2 while doing pretty much identical tasks. Either way, it's a piss poor performance compared to what it was like when it was new. My battery indicator will also drop from something like 80% to 25% within a matter of minutes, then randomly go back up to around 40%.... then discharge to 0% very fast. SMC reset does nothing for the weird percentage readings. I need to get it replaced as I'm a student and being tethered to an outlet all the time (or else risk my MBA randomly dying in the middle of a lecture.. which has happened multiple times already) is annoying. I just got this laptop like a month ago. 18 cycles or so.. Battery life still 100%. Though when I had it plugged in, it said that the capacity was 99.8%. Then I unplugged it and it said it was 100%. So, idk. Anyways, I don't really count in this thread. Lithium batteries don't need to be drained. In fact, a deep drain on a lithium battery results in permanent damage. Keeping them at 100% all the time also causes a loss in capacity. I didn't say completely drained. I meant like 15-20% or so. Sorry, should've clarified.